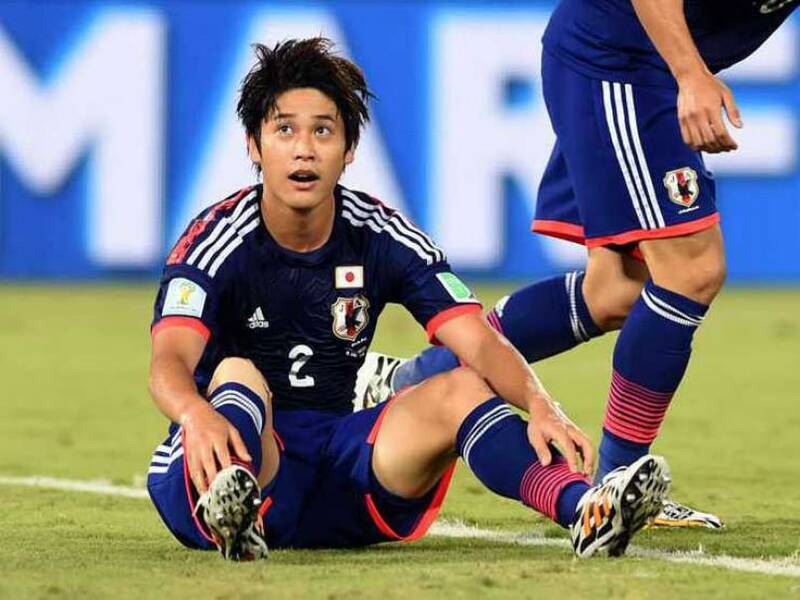 Japan were rather average today - they were, surprisingly, more like Arsenal than Ghana was. Meaning that, though they absolutely dominated possession, they had little attacking prowess in the final third and could not find a finisher. In particular, they had a couple or more good opportunities at the end they failed to put away against an opposition that was a man down. Japan appeared to me to be too scared to take risks by entering into the penalty area and, disappointingly, chose to tamely pass the ball around and outside the penalty area. Perhaps the mere idea of physical confrontation with the Greek defenders was too much for the overtly-technical Japanese? Or perhaps it was a mistake to leave Kagawa on the bench for such a long period of time? The Greeks, however, defended superbly with 10 men. In fact, not only that, but I thought they had the better shots on target than Japan and it looked like the sort of game where one would expect Japan not to score given how poorly they were playing. Counter-intuitively, some of Greece's best chances of the match came immediately after they had lost Katsouranis from the red card. 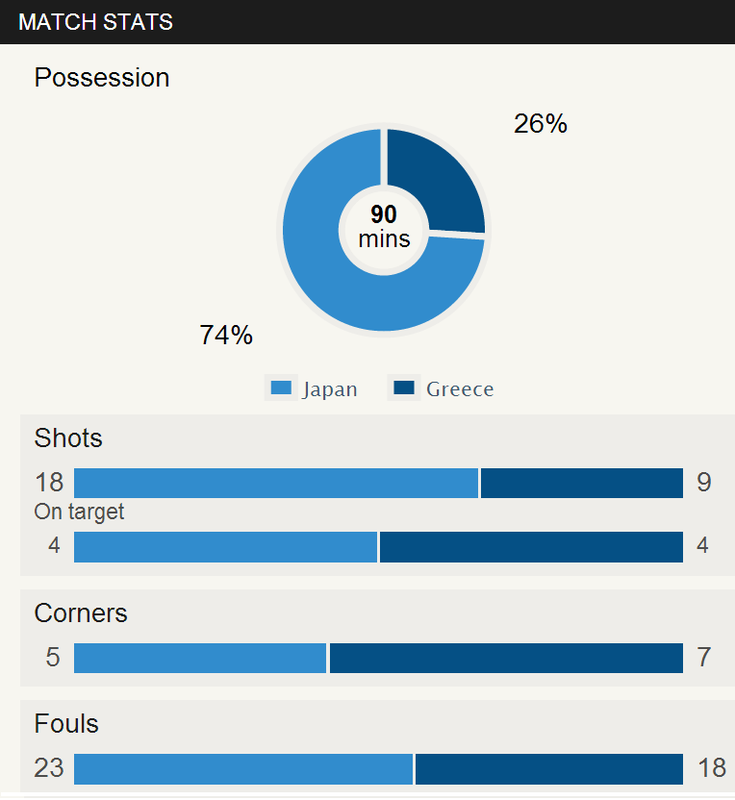 Most tellingly, Japan only had 4 shots on target despite their 74% possession. Greece equalled that with only 26% possession!!! Greece were probably on balance the better side, but that doesn't mean they deserved to win. If they play like they did today quite obviously Japan will have a hard time against Colombia -- all Colombia needs is a draw to seal first spot. Even if Japan wins, they must rely on the Greeks upsetting the Ivory Coast (and a larger goal difference than either the Ivory Coast or Greece, if there is a draw or a Greek victory respectively). The game between Ivory Coast and Greece will be interesting but the odds are obviously in Ivory Coast's favour; Greece will need to steal a win to get through, and rely on the Japanese not scoring too many goals against Colombia (which is very likely given . I watched a replay of this match. I can't believe that Suarez made all the difference. In terms of converting opportunities, he is all that a manager could ever ask for. I'm surprised that I accidentally left my tip on footytips as an England win - I was so sure in my head that I had put Uruguay to win at the start of the match. 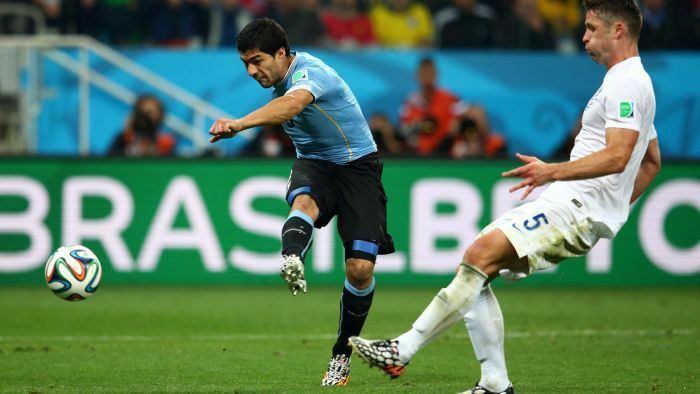 I knew Suarez would make the difference, but to be honest, I didn't know he would be that potent. I think the English public's criticism of the English team is a bit over the top - but I suppose that it's only natural to have such a passionate view of your own national team. True that, when it mattered, England could not produce moments of quality to go ahead or defend against Suarez, but that doesn't mean that Rooney should be singled out as the culprit. Rooney actually moved into a brilliant position to score the equaliser, even if it was a simple tap in (many players don't have such an instinct to get into the right position). People also expect too much of him, though perhaps they can't be blamed for doing so given his Premier League form. But my point is that, this is a team game and there are other players to blame (both as a collective and individually) and it is a bit disappointing to see people singling out one or two men for the gallows. The second Suarez goal was slightly fortuitous, coming from a goalkeeper's kick and off the back of Gerrard's head it seems. But that's football, what can you do? Looks like England need a miracle. Italy need to win their remaining games and England need to score at least two goals against Costa Rica to overcome the goal difference (assuming Italy wins 1-0 against Costa Rica). From now on, if any two of England's competitors draw, England is out. I didn't get to see the full Colombia and Ivory Coast match but it looked like a fast-paced match; the Ivory Coast defence only have themselves to blame for conceding the second goal. On the surface level it looks like Ivory Coast probably deserved a point from that game, but I can't be sure. Kudos to Colombia for their clinical finishing when the chances presented themselves. From the stats the Ivory Coast had more shots on target and a higher possession, but obviously those statistics weren't effective enough! Colombia look like an interesting candidate in this competition. I'm quite happy to hear that this is the first time in their World Cup history that they've won two matches in a row and with that, the first time they've qualified for the knockout stages as well!